If you were to picture a typical gig headlined by an electronic supergroup like Above & Beyond, surely the last image you’d conjure in your mind would be a sophisticated show at a venue like London’s Royal Albert Hall. But that’s just where a few thousand of the trance trio’s most dedicated fans found themselves for the opening leg of their Acoustic tour in early May. Following the success of the group’s first acoustic shows at Porchester Hall and The Greek Theater in Los Angeles, which allowed members Jono Grant, Tony McGuinness and Paavo Siljamaki to demonstrate their artistic talents with a variety of instruments alongside an ensemble of orchestral musicians, the decision was made to take it to the next level in 2016 with a tour of some of the world’s most prestigious concert halls. Speaking to Howat it’s clear he relishes challenges like these, but as well as giving him the chance to use the experience he’s gained working for the likes of Morrissey, Paolo Nutini and Franz Ferdinand to the test, the gig also gave him the chance to get those busy hands of his on Allen & Heath’s new dLive desk again – a system he has been helping to develop through the early stages of its life cycle. 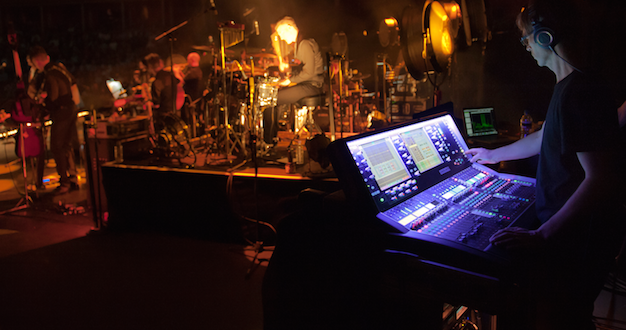 Being an iLive user previously, the step up to dLive was a relatively straightforward one for Howat, and after some initial trials the console turned out to be precisely that – a step up. “I’ve had a bit of time on the iLive the last couple of years and used it on those three bands. I love the surface versatility, the fact that you can put things where you want them and change them around on a whim and the intuitive and fast nature of it. 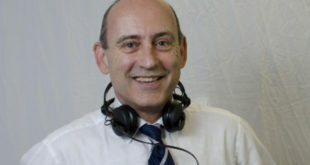 The dLive has taken that and run with it, and upped the ante in terms of sonic quality,” he says. Not only does Howat have a pretty packed stage to deal with, several of the musicians can be seen moving about and changing positions throughout the show, which of course can make things tricky for the monitor engineer, but for this one, it’s all about good preparation when in these kinds of situations. The dLive was supplied by F1 Sound and sub-hired by Capital Sound, the audio supplier responsible for the European leg of the tour and the Martin Audio MLA system that loomed large over the audience all evening. With 14 MLA per side for the mains, another 14 MLA-C on the sides and a slightly increased flown sub element of four MLX with a further two under the stage extension, FOH engineer Ben Findlay – equipped with Avid Profile – could be confident of no nasty surprises from the PA on offer to him. The Hall itself would’ve given him something to think about, however, according to Capital’s senior project manager Martin Connolly: “The Royal Albert Hall can be a difficult sounding venue; it can be very easy to let the acoustic qualities of the venue take over, but Ben did an amazing job and kept everything clean, in its own place and I was impressed with the mix and sound that he achieved,” he states. 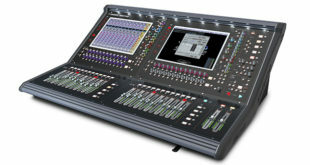 Back to the monitor control package, and another tool that has been brought in to make Howat’s life that little bit easier on this particular job is the ME-1 personal mixing system – also from Allen & Heath – which is being used by a number of musicians on stage, and there are plans to add more to the kit list when the tour moves across The Atlantic. “It has freed me because key musicians using an ME-1 gives me the freedom to deal with the other half of the stage. In a conceptual way I divided the side front to back and the back of the stage wasn’t going to be automated, and the front was,” Howat explains. “The ME-1s make that possible because the two drummers and the musical director all have an ME-1 each. It gives the drummers autonomy – one of them is responsible for all the playback so he needs to be able to override his mix and he loves the fact that he doesn’t have to hassle the monitor guy for things. 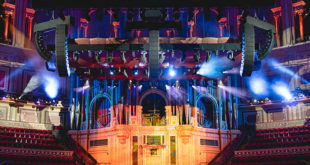 As well as the Bowl, Above & Beyond can look forward to playing in other iconic spaces like the Sydney Opera House and Waikiki Shell in Hawaii, but the RAH can certainly be considered the ideal first stop on a tour of this kind.